Treatment of primary mouse osteoblasts with retinoic acid produces a homogeneous population of ramified cells bearing morphological and molecular features of osteocytes. The method overcomes the difficulty of obtaining and maintaining primary osteocytes in culture, and can be advantageous to study cells derived from transgenic models. Mattinzoli, D., Messa, P., Corbelli, A., Ikehata, M., Mondini, A., Zennaro, C., Armelloni, S., Li, M., Giardino, L., Rastaldi, M. P. Application of Retinoic Acid to Obtain Osteocytes Cultures from Primary Mouse Osteoblasts. J. Vis. Exp. (87), e51465, doi:10.3791/51465 (2014). The need for osteocyte cultures is well known to the community of bone researchers; isolation of primary osteocytes is difficult and produces low cell numbers. Therefore, the most widely used cellular system is the osteocyte-like MLO-Y4 cell line. The method here described refers to the use of retinoic acid to generate a homogeneous population of ramified cells with morphological and molecular osteocyte features. After isolation of osteoblasts from mouse calvaria, all-trans retinoic acid (ATRA) is added to cell medium, and cell monitoring is conducted daily under an inverted microscope. First morphological changes are detectable after 2 days of treatment and differentiation is generally complete in 5 days, with progressive development of dendrites, loss of the ability to produce extracellular matrix, down-regulation of osteoblast markers and up-regulation of osteocyte-specific molecules. Daily cell monitoring is needed because of the inherent variability of primary cells, and the protocol can be adapted with minimal variation to cells obtained from different mouse strains and applied to transgenic models. The method is easy to perform and does not require special instrumentation, it is highly reproducible, and rapidly generates a mature osteocyte population in complete absence of extracellular matrix, allowing the use of these cells for unlimited biological applications. Osteocytes, the most abundant bone cell type, are terminally differentiated, highly ramified cells deeply located within the skeleton. The cell body of mature osteocytes are contained in bone lacunae and have diverse shapes; osteocytes with elongated cell bodies are found in the cortical bone, whereas rounded osteocytes are more frequent in the trabecular bone1. Branched dendrites extend from the cell body and reside in tiny channels called canaliculi, forming an intricate web that makes multiple contacts not only with other osteocytes, but also with other bone cell types, bone marrow, blood vessels and associated pericytes. Through the interstitial fluid contained in lacunae and canaliculi, osteocytes are also ultimately connected to the circulating system, therefore they can influence not only local but also systemic events, and vice versa their behavior can be regulated by both local and systemic changes2. The study of osteocytes has recently gained momentum, thanks to several technical advances, such as the generation of tissue- and cell-specific transgenic animals, the use of powerful microscopy techniques and of high-throughput molecular screening3,4. However, knowledge of these cells is still incomplete, mainly due to the relative scarcity of adequate in vitro models. Actually, osteocytes have been always difficult to obtain and maintain in culture because of the deep location, and the low level of proliferation that characterizes such a differentiated cell type. Along the years, a number of methods have been developed to isolate primary osteocytes5-7, though they generally produce low cell yields and carry the risk that even a few contaminating fibroblasts will rapidly overgrow the osteocytes8. For this reason, most experimental in vitro work has been conducted so far on the well-established osteocyte cell line MLO-Y4 9. Additional in vitro methodologies could enhance the possibility of studying these cells and could improve the analysis of osteocyte biology and pathophysiology. To be largely adopted, such methods should be easy to reproduce, and would not require special instrumentation or very long times to reach cell maturation. Importantly, if applicable to primary cells, they would make it possible to take advantage of transgenic animals. We recently described that treatment of the osteoblast cell line MC3T3-E1 and of primary osteoblasts with retinoic acid induces a rapid phenotype change leading to the development of a homogeneous population of ramified cells bearing morphological and molecular features of osteocytes10. All-trans retinoic acid (ATRA) is an active metabolic product of vitamin A which regulates gene transcription by binding the nuclear retinoic acid receptors (RARs). RARs bind to DNA as heterodimers with the retinoid X receptors (RXRs), ultimately leading to modulation of retinoic acid (RA)-responsive target genes11. ATRA has been shown to modulate differentiation and maturation of several cell types, among them other ramified cells such as neuronal cells12 and podocytes13. The method here described is based on addition of ATRA to primary osteoblasts. To be effective, ATRA has to be added at a precise maturation stage on cells plated at a defined density; in our experience these conditions are critical to obtain the phenotype switch from osteoblasts to osteocytes. All animal experiments were performed according to the National and European current regulations regarding the protection of animals used for scientific purposes and were reviewed and approved by the ethical committee of Milan University. The method, with minor modification, follows the procedure described by Dodig et al14. Prepare digesting medium, by adding 0.1% Collagenase P and 0.05% Trypsin (starting from 2.5% Trypsin 10X, no phenol red) to HBSS medium (Hanks Balanced Salt Solution, no calcium, magnesium, or phenol red). Use 3-4 day old mice (the procedure can be applied to as few as 1 mouse). Sacrifice by decapitation. Spray the head with 70% ethanol and keep on ice. Remove skin and muscle layers by tweezers and dissecting/surgical scissors. Gently remove the parietal bones and separate them by following the sagittal suture in two halves. Make sure bones are free of sutures and any adherent tissue and place individual bone pieces in well-plates containing HBSS medium until the procedure is completed. Discard HBSS and add to each well the digesting medium for 15 min at 37 °C. Add again the digesting medium for 15 min at 37 °C. This time save the supernatant and place it in alpha-MEM (Minimum Essential Medium) supplemented with 10% FBS (Fetal Bovine Serum) and 1% streptomycin/penicillin. Repeat steps 1.7 and 1.8 2x. Pool the three collected fractions, spin cells by centrifuging at 425 g for 5 min, discard the supernatant, add 3 ml of supplemented alpha-MEM to resuspend the cell pellet, and transfer to a 25 cm2 flask. Change the medium after 24 hr to remove debris and dead cells. Add 50 µg/ml ascorbic acid (AA) and 3 mM glycerol 2-phosphate disodium salt hydrate (GP) to the alpha-MEM medium. Thereafter, change the medium (alpha-MEM plus AA/GP) every other day. Conduct all experiments with ATRA (All-Trans Retinoic Acid) in a darkened room to prevent inactivation. Prepare a 1X trypsin solution in HBSS medium and keep at 37 °C until use. Remove the medium from subconfluent cells and carefully wash them with HBSS. Add 1 ml trypsin, gently rotate the flask to allow all cells to be covered by trypsin, and incubate for 3 min at 37 °C. Check for the actual detachment of cells under an inverted microscope. Add 3 ml of alpha-MEM medium to inactivate trypsin. Recover the cells and centrifuge for 15 min at 425 g.
Resuspend the cell pellet in fresh medium. Place a drop in a hemocytometer counting chamber, allow to settle for a few min and count the cell number. Place cells in 25 cm2 flasks at a density of 10,000 cells/cm2 with alpha-MEM plus AA/GP. Be aware that cell density is relevant to the optimal development of cell processes and intercellular contacts. A starting density higher than 10,000 cells/cm2 impairs proper development of cell processes, but lower cell numbers result in premature cell death, due to the absence of intercellular contacts. Add 5 µM ATRA to the medium every 24 hr. Monitor the cells daily to assess morphology: morphological changes are generally observed after 48 hr. If, after the first 24-48 hr, cells are still proliferating, replate at the above density. A homogeneous population of mature osteocytes is present after 4-5 days. Depending on the needs, use cells at any time point, up to 12-15 days. When cells are plated on other supports (such as coverslips or well-plates), be sure that the above density is maintained and continue to add ATRA every 24 hr until use. Leave cells to adhere to the new support for at least 24 hr before the experiment. For immunostaining, plate the cells on coverslips and follow established methodologies (see for instance Burry15). For example, for indirect immunofluorescence, fix in 4% paraformaldehyde or cold acetone, incubate sequentially with the primary antibody at RT for 1 hr in a humidified chamber, then with the secondary fluorescent-labeled antibody in the dark, at RT for 30 min, in a humidified chamber. Use DAPI or analogues for nuclear counterstaining, and mount in anti-fading medium. Plate the cells on coverslips. Fix the cells by immersing the coverslip in 70% ethanol for 10 min. Cover the cells with some drops of alizarin red staining solution (1 mg/ml, pH 5.5) for 30 min. Wash the coverslips with tap water. Mount with a drop of glycerol on glass slides and take images using an upright microscope at 10X and 20X magnification. After the above procedure, recover the coverslips by immersing the slides in tap water. Put each coverslip in a well plate. Add 60% perchloric acid (the quantity has to be enough to completely cover the cells) and leave O/N at 4 °C with gentle agitation. Read the optical density of the supernatant by spectrophotometry at 450 nm wavelength. To normalize values for cell number, add Janus Green (0.2% solution in PBS) to cover the cell preparation for 10 min. Wash carefully with ultrapure water. Add 0.5 N HCl (the quantity has to be enough to cover all cells) and shake gently by hand for a few sec. Read the absorbance at 615 nm by spectrophotometry. Results were obtained from 5 to 10 independent experiments. AA/GP treated primary cells have mostly cobblestone-like features, characteristic of mature osteoblasts. Interspersed ramified cells (as indicated by red arrows in Figure 1A) can be found, which likely represent some osteocytes. With ATRA treatment, cells rapidly start displaying ramifications, which are generally observed after 2 days. As shown in Figure 1B, ramified cells require space to extend their dendrites. As the treatment with ATRA proceeds, ramifications progressively increase in number and complexity, Figures 1C and 1D. Staining of filamentous actin by rhodamine-labeled phalloidin highlights cell processes, which are labeled by phalloidin, Figure 2. Primary osteoblasts produce large amounts of calcified matrix, which accumulates over and among cells and can be visualized by alizarin red staining, Figure 3A. 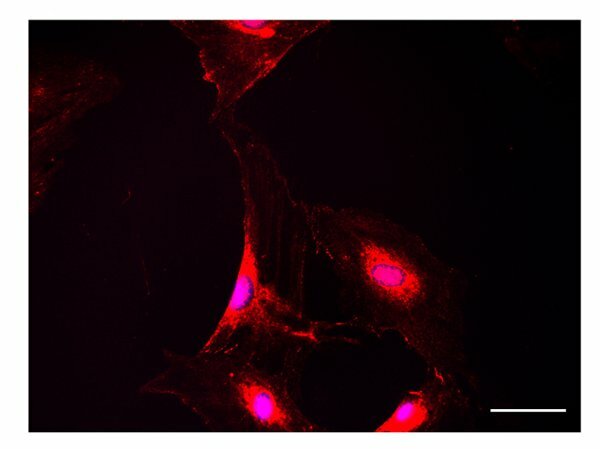 Osteocytes do not produce calcified extracellular matrix, and alizarin red staining results completely negative in ATRA-incubated cells, Figure 3B. Accordingly, none or a minimal quantity of alizarin red can be measured after the extraction procedure, Figure 3C. Sclerostin is expressed by ATRA-treated cells, Figure 4. Immunostaining reveals intense cytoplasmic expression and the presence of positive dots along cell processes. By immunofluorescence, a strong FGF23 positivity is detectable in ATRA-treated cells, Figure 5, either in the cell body or along cell processes. Figure 1. Light microscopy. Primary osteoblasts show a predominant cuboidal appearance after 5 days incubation with AA/GP (A) (scale bar 100 µm). Sparse ramified cells can be identified (A) (arrows). After 2 days of ATRA treatment (B) (scale bar 100 µm), cells display a more elongated shape and dendrites appear clearly detectable. Only arborized cells can be observed after 5 days of ATRA incubation (C) (scale bar 100 µm), and are better detectable at higher magnification (D) (scale bar 50 µm). Figure 2. Actin filament staining. Actin filaments are identified by Rhodamine-falloidin staining. The figure shows a representative result obtained from cells treated with ATRA for 3 days. Already at this time point, filamentous actin appears as a major component of developing cell processes. Scale bar: 50 µm. Figure 3. Calcified deposits. 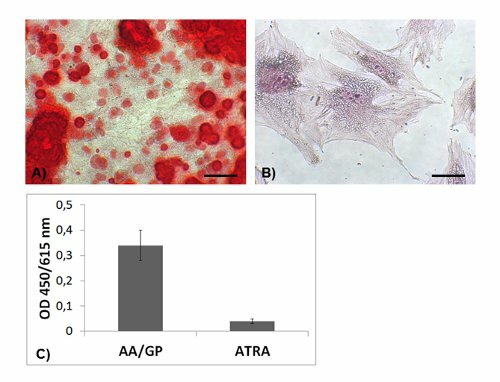 Alizarin red staining is diffusely observed in osteoblasts after 5 days incubation with AA/GP (A) (scale bar 100 µm), whereas is negative in ATRA-incubated cells (B) (scale bar 50 µm). A profound difference can be measured by spectroscopy after alizarin extraction (C). Figure 4. Sclerostin. Sclerostin positivity is detected in the cytoplasm and along cell processes of cells incubated with ATRA (scale bar 50 µm). Figure 5. FGF23. FGF23 immunostaining is intense in ATRA-treated cells (scale bar 50 µm). In the last years the osteocyte has emerged as the most central cell in the bone. Research advances are progressively revealing a number of previously unsuspected or unproven osteocyte properties, which are of enormous value for designing novel and better treatment for a variety of bone diseases. However, investigation of osteocyte biology has been suffering from the limited availability of in vitro models to such an extent that osteoblasts have been used as surrogate cells over a long period before the osteocyte-like cell line MLO-Y4 was made available. More recently, a conditionally immortalized cell line was introduced by the same group16, which can be differentiated to ramified late osteocytes expressing sclerostin and FGF23. Though the extreme value of these cell lines is not under question, it is very well known that primary cells resemble more the in vivo situation and offer the possibility to obtain primary osteocytes from transgenic animals to perform functional studies on specific molecular pathways. Isolation and culture of primary osteocytes, first obtained from chick bones5,6 and subsequently from rat and mouse bones17,7, are extremely useful but their isolation generates only a small number of cells per procedure, and cell purity relies to a large extent on individual expertise. Therefore, the method is currently used only by a limited number of laboratories. Other research groups have obtained mature osteocytes by inducing terminal differentiation of osteoblasts through progressive embedding in three-dimensional mineralized matrices18,19, that constitute a more physiological environment but are an obstacle to subsequent research applications. It is true that matrix mineralization20, as well as low oxygen tension21, are physiological triggers of osteocyte maturation. However, a methodology avoiding these two conditions could increase feasibility and extend the use of the cells. Our proposed method10, which consists of adding retinoic acid to mature osteoblasts, is simple, highly reproducible, and avoids cell transfection22 or the use of expensive growth factors23. With a series of preliminary experiments, we determined that the starting cell number is a critical step, conditioning proper formation of multiple dendrites and intercellular contacts. A too high plating cell density affects complexity and extension of cell processes, whereas too low numbers result in loss of intercellular adhesions, leading to cell suffering and death. Importantly, adjustment of ATRA dosage and daily monitoring of cell morphology are highly recommended, because of the inherent variability of primary cells which can affect the sensitivity to ATRA. These aspects can become particularly relevant when the methodology is applied to transgenic models. The development of cell processes can be monitored by actin staining, because dendrites are rich in filamentous actin. It is well known that osteocytes do not produce calcified matrix, and ATRA incubation rapidly abolishes it, as shown by progressive reduction till complete negativity of alizarin red staining. Meanwhile, ATRA induces the expression of well-known osteocyte markers, most notably sclerostin24, and ensures production of FGF23, a fundamental growth factor involved in bone and systemic phosphate handling25. Therefore, further studies aimed at investigating the functional role of FGF23 and sclerostin in osteocytes will be facilitated by the endogenous production of these molecules. In summary, we show that treatment with retinoic acid generates a homogeneous population of mature osteocytes from primary calvaria cells, therefore allowing simple and rapid preparation of osteocytes from both wild type and transgenic animals. Compared to other methods, our protocol seems to present several advantages, primarily the simple application and the high reproducibility. The process of osteocyte maturation can be studied in adequate numbers of cells from the initial spreading of processes through several steps that occur in a 5-day frame. As a further advantage, mature osteocytes are obtained in complete absence of surrounding mineralized matrix, allowing the application of unlimited molecular and functional assays. Paraformaldehyde Sigma-Aldrich P6148 Dissolve in PBS and filter before use. Always work under a chemical hood. Schneider, P., Meier, M., Wepf, R., Müller, R. Towards quantitative 3D imaging of the osteocyte lacuno-canalicular network. Bone. 47, (5), 848-858 (2010). Cheng, F., Hulley, P. The osteocyte--a novel endocrine regulator of body phosphate homeostasis. Maturitas. 67, (4), 327-338 (2010). Paic, F., et al. Identification of differentially expressed genes between osteoblasts and osteocytes. 45, (4), 682-692 (2009). Dallas, S. L., Bonewald, L. F. Dynamics of the transition from osteoblast to osteocyte. Ann N Y Acad Sci. 1192, 437-443 (2010). van der Plas, A., Nijweide, P. J. 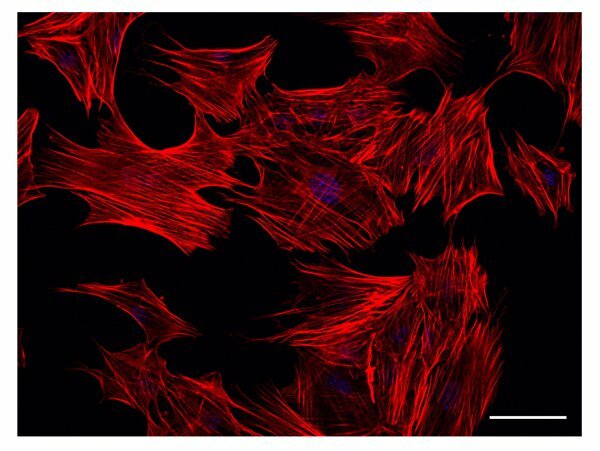 Isolation and purification of osteocytes. J Bone Miner Res. 7, (4), 389-396 (1992). Nijweide, P. J., van der Plas, A., Alblas, M. J., Klein-Nulend, J. Osteocyte isolation and culture. Methods Mol Med. 80, 41-50 (2003). Stern, A. R., Stern, M. M., Van Dyke, M. E., Jähn, K., Prideaux, M., Bonewald, L. F. Isolation and culture of primary osteocytes from the long bones of skeletally mature and aged mice. Biotechniques. 52, (6), 361-373 Forthcoming. Kalajzic, I., Matthews, B. G., Torreggiani, E., Harris, M. A., Divieti Pajevic, P., Harris, S. E. In vitro and in vivo approaches to study osteocyte. Bone. 54, (2), 296-206 Forthcoming. Bonewald, L. F. Establishment and characterization of an osteocyte-like cell line, MLO-Y4. J Bone Miner Metab. 17, (1), 61-65 (1999). Mattinzoli, D., et al. 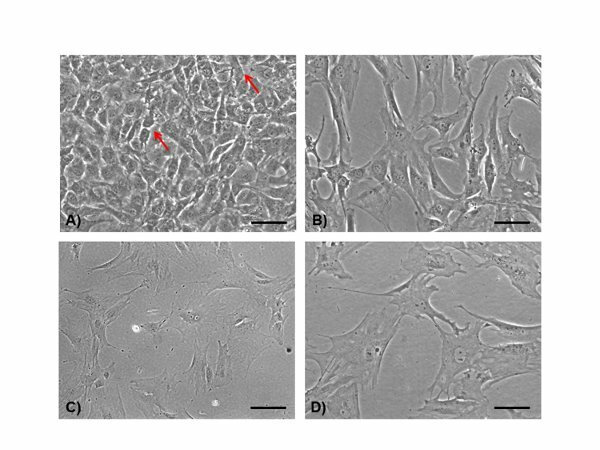 A novel model of in vitro osteocytogenesis induced by retinoic acid treatment. Eur Cell Mater. 24, 403-425 (2012). Clagett-Dame, M., McNeill, E. M., Muley, P. D. Role of all-trans retinoic acid in neurite outgrowth and axonal elongation. J Neurobiol. 66, (7), 739-756 (2006). Vaughan, M. R., et al. ATRA induces podocyte differentiation and alters nephrin and podocin expression in vitro and in vivo. Kidney Int. 68, (1), 133-144 (2005). Dodig, M., et al. Identification of a TAAT-containing motif required for high level expression of the COL1A1 promoter in differentiated osteoblasts of transgenic mice. J Biol Chem. 271, (27), 16422-16429 (1996). Burry, R. W. Immunocytochemistry. A practical guide for biomedical research. Springer. New York Dordrecht Heidelberg London. (2010). Woo, S. M., Rosse, rJ., Dusevich, V., Kalajzic, I., Bonewald, L. F. Cell line IDG-SW3 replicates osteoblast-to-late-osteocyte differentiation in vitro and accelerates bone formation in vivo. J Bone Miner Res. 26, (11), 2634-2646 (2011). Gu, G., Nars, M., Hentune, nT. A., Metsikkö, K., Väänänen, H. K. Isolated primary osteocytes express functional gap junctions in vitro. Cell Tissue Res. 323, (2), 263-271 (2006). Boukhechba, F., et al. Human primary osteocyte differentiation in a 3D culture system. J Bone Miner Res. 24, (11), 1927-1935 (2009). Krishnan, V., Dhurjati, R., Vogler, E. A., Mastro, A. M. Osteogenesis in vitro: from pre-osteoblasts to osteocytes: a contribution from the Osteobiology Research Group, The Pennsylvania State University. In Vitro Cell Dev Biol Anim. 46, (1), 28-35 Forthcoming. Irie, K., Ejiri, S., Sakakura, Y., Shibui, T., Yajima, T. Matrix mineralization as a trigger for osteocyte maturation. J Histochem Cytochem. 56, (6), 561-567 Forthcoming. Hirao, M., et al. Oxygen tension is an important mediator of the transformation of osteoblasts to osteocytes. J Bone Miner Metab. 25, (5), 266-276 (2007). Brounais, B., et al. Long term oncostatin M treatment induces an osteocyte-like differentiation on osteosarcoma and calvaria. Bone. 44, (5), 830-839 (2009). Gupta, R. R., Yoo, D. J., Hebert, C., Niger, C., Stains, J. P. Induction of an osteocyte-like phenotype by fibroblast growth factor-2. Biochem Biophys Res Commun. 402, (2), 258-264 (2010). Poole, K. E., et al. Sclerostin is a delayed secreted product of osteocytes that inhibits bone formation. FASEB J. 19, (13), 1842-1844 (2005). Dallas, S. L., Prideaux, M., Bonewald, L. F. The Osteocyte: An Endocrine Cell and More. Endocr Rev. 34, (5), 658-690 (2013).